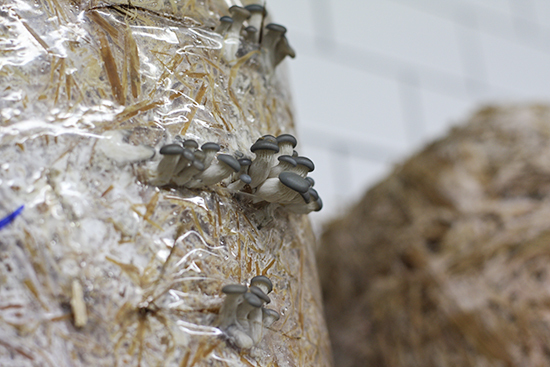 October is mushroom month at Babylonstoren. 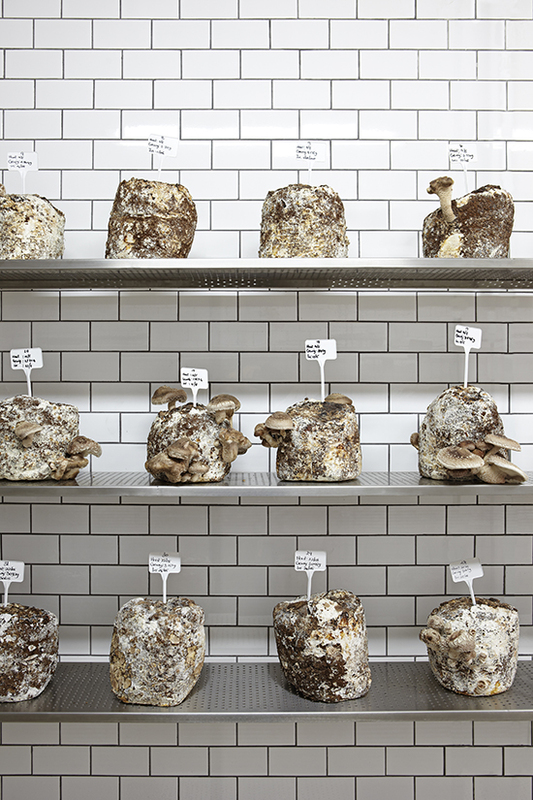 In our mushroom cellar, a hi-tech space in which light, humidity and temperature are strictly controlled, we are experimenting with a few varieties. The shiitake mushrooms grow in blocks of compressed wood shavings, which are inoculated with just the right mushroom spores. It takes a few weeks for the mushrooms to break the surface, where they shortly mature to harvestable. The room is kept spotlessly clean, so only carers & harvesters are allowed past the glass panel. 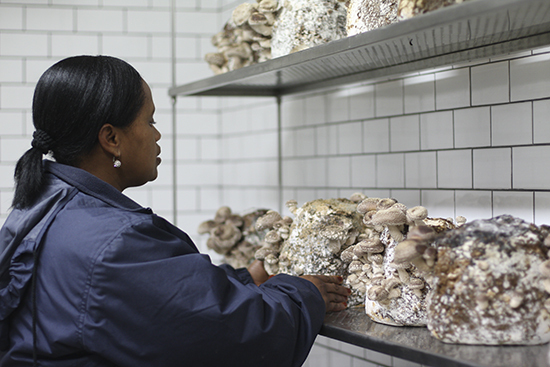 Mushrooms are picked daily for use in Babel and to make our unique shiitake biltong. The pink and grey oyster mushrooms are more recent additions. They grow in bags filled with straw. We make a few cuts in the bags for the mushrooms to grow through – small cuts stimulate single big mushrooms while longer cuts usually give many small mushrooms. 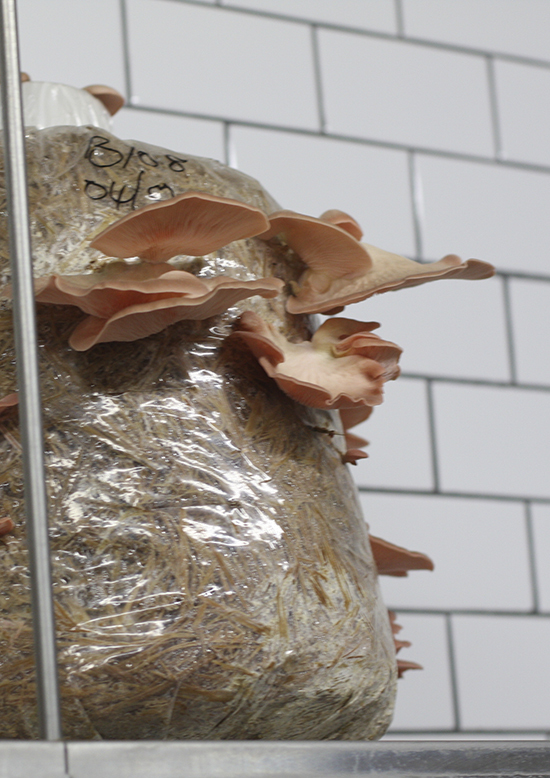 The pink oyster mushroom has a delicate anise seed flavour, when cooked their taste is fragile and earthy. Grey oyster mushrooms are rather mild and sweet in flavour and make a wonderful accompaniment for fish. Preheat the oven to 250°C. Take 3 or 4 shiitake mushrooms and remove the stalks, as they are too chewy to cook (use stalks in a stock or sauce for flavour). Rub the mushrooms with herb oil. Grate a generous amount, about 80g, of hard cheese such as Parmesan over the mushrooms and the rest of the plate and place in the oven for 5 minutes, allowing the cheese to start melting. Remove from the oven and allow to cool slightly. Use a wide spatula to transfer the mushrooms and cheese as one to a warm plate. If the cheese starts to soften, place under the grill. 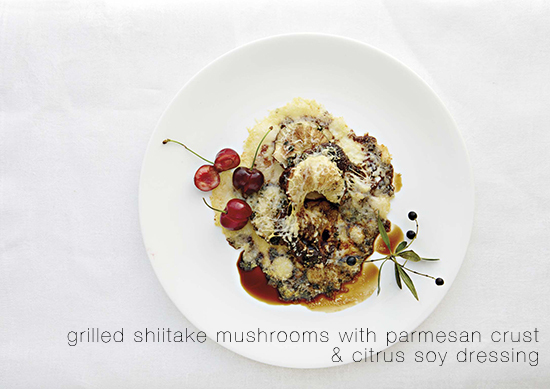 Drizzle with citrus soy dressing and garnish with fresh cherries and olienhout (wild) olives. The mushrooms should not be overcooked or stand for too long because they will draw water and the dish will become soggy. For the citrus soy dressing, combine the following: 45ml ponzu sauce (citrus-based sauce commonly used in Japanese cuisine, available from most speciality food stores), 15ml lime juice, 10ml honey and 5ml Chinese five-spice powder.